Sometimes others' actions can take great toll on an individual. In Holden, J.D. Salinger can't quite seem to follow up the success of "The Catcher in the Rye" after he's haunted by the actions of some infamous assassins. Written and directed by Anisa George, George & Co's production is a surrealist fever dream to say the least. 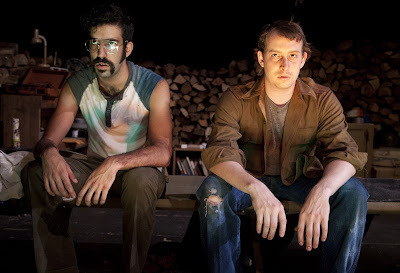 The play begins with a trio of men in a rustic cabin preparing for another to awake and write. The stakes are high as the man needs to write a follow up to his greatest success. That success just happens to be "The Catcher in the Rye." Chapman, Hinckley, and Zev rally Salinger around his typewriter but can't get him to finish his follow up. The catch is this trio isn’t really there. Salinger is haunted by the spirits of assassins who obsessed over "The Catcher in the Rye", two of whom possessed it after they shot John Lennon and Ronald Reagan. Holden is a fantastically dark exploration of the internal search for self through the lens of violence. Using notable names, George and her company have allowed an instant way in for the audience. The extension thankfully never feels gimmicky when identities are revealed. Whether you know the complete history of the individuals or not, knowing just the big highlights, such as who killed, or tried to kill, who crafts a direct narrative that prevents George from needing to include extensive exposition. But it's the pair of characters that do not have a notable identity that are the big mysteries of Holden. And in turn, they are intriguing. Who is this Zev of the future and why is this little girl meandering around Salinger's cabin? We get a grand reveal at the end with the girl but Zev's identity is a little more uncertain. Zev represents a person and idea of what has yet to come. Someone who will be. But at the start, Mark David Chapman and John Hinckley ask how he got there and finally learn why he is there. But is Zev's presence consistent with the rules of the world? Is it a stronger choice to have Zev go on the journey to find himself and realize who he is by giving him a specific horrific act? No matter what, George and her company have set up a bold new world that is just mystifying as it is terrifying. With Anisa George serving as the creator and director, Holden was a mark of a singular vision. For the most part, her consistency in creating her world followed through but there were moments you wished a trimming or two would occur. Despite a brisk running time, Holden does not move along swiftly. Holden lived heavily in silence. It was mostly earned and can be completely earned should the trimming occur. As it stands now, the balance is off kilter causing the piece to be unintentionally slow moving, even during those bursts of excitement. George created a world that was physically intricate and strongly developed. The characters were well lived in. They moved independently of one another yet had a cohesive bond. To create Salinger’s hideaway writing bunker, scenic designer Nick Benacerraf used logs to create walls with just the essentials in the way of furniture. It had an earthy, rustic feel that brought out a particular eeriness. Lighting designer Seth Reiser’s mesmerizing design was evocative. Through the use of vibrant color and darkness, the uneasy mood raised the stakes through its intensity as was matched with Alex Bechtel’s sound design. The costumes from Rebecca Kanach rightly kept the time and place in question. Each outfit was reminiscent of their counterpart yet still had individuality. Though, if being hyper critical, putting Zev in jean shorts seemed a bit strange. It takes immense talent and skill to bring humanity into two people deemed as monsters by society. Jaime Maseda and Scott R. Sheppard as Chapman and Hinckley painted the pair with such a firm stroke that empathy for their situation was immediate. A sense of understanding resonated. Matteo Scammell as Zev threw himself about with the greatest of ease. Scammell gave Zev a resounding egotism that helped to bring out the kinder sides of Chapman and Hinckley. Whether Anisa George and her ensemble shattered your thoughts or you had to dig a bit deeper for it, the message within is unquestionable. Holden’s disturbing venture through violence is an ambitious conceit. “The Catcher in the Rye” doesn’t directly lead to violence but the discussion on what the character has done to people’s psyche is the draw of Holden.